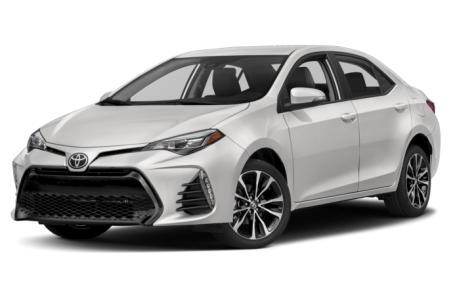 The 2018 Toyota Corolla is a popular compact sedan that seats five passengers. It competes with the Honda Civic, Nissan Sentra, and Ford Focus. Six trims are available: the L, LE, LE ECO, SE, XSE, and XLE. It is powered by a standard 132-hp, 1.8-liter 4-cylinder engine mated to a 2-speed continuously variable automatic transmission (CVT) or a 6-speed manual. The LE Eco is tuned to produce 140-hp with the same engine. 5 of 6 (83%) consumers said they would recommend this vehicle to a friend.